Greetings, Comrade! I'm Real Soviet Bear aka Miodrag Kovachevic and I need your support to continue improving my Bearsona system. The Bearsonas are cute little bears that walk around streams. Each viewer who follows the channel gets one bear of their own that they can customize with hats, clothes or accessories. Here's how it works. The goal of the system is to offer a fun loyalty system that isn't gated behind spending money on the channel. I always disliked that Twitch had badges and features for viewers gated behind paywalls, so I wanted something for everyone. I'm a professional game designer with 6 years of industry experience and before that another 5 years of games writing/journalism experience. I have been streaming for 3 years now, first on Hitbox and for the past 2 years on Twitch. My strengths are game design and community management. This project is a practical application of those two onto streams. Rather than streaming game development, I instead try to build a game around streams. Since I am only Twitch affiliate, payouts are quite spread out. I was uncomfortable asking for money until earlier this year, but now I'm confident in the quality of the streams. Twitch is not my day job, nor will it ever be! This is a hobby I want to invest in and improve (and have already invested over a thousand dollars total for the past 3 years). My primary goal is to make these monthly bearsona updates self-sufficient, while anything beyond that is a bonus. If down the line the channel could cover all of its expenses, that would be fantastic. The milestones are all calculated based on how much each component costs. As I'm just a designer, so I need to commission artist and programmer time. If there is any leftover money between milestones, that will be spread to improve other features (like more sprite art or background art). Aside from myself, I commission specific folk for different features. Lloyd has helped establish the Real Soviet Bear brand to be approachable, friendly, while at the same time mature. We work really well together and have managed to deliver every monthly update on time. The backgrounds will be done by 2bitcrook, most famous for Game Boy Demakes. 2bitcrook will supply simple backgrounds in the style above, making it feel more lively, without it feeling cluttered. Finally, the coding part of the bot is done by my friend Rajsic Sasa. While we do not modify anything in the Stream Avatars application, we figure out clever tricks to piggy-back on it with custom bot functionality. HOW RELIABLE IS ALL OF THIS? The experience system launched in 2017 and has been built upon with a lot of trial and error until I got the format right. 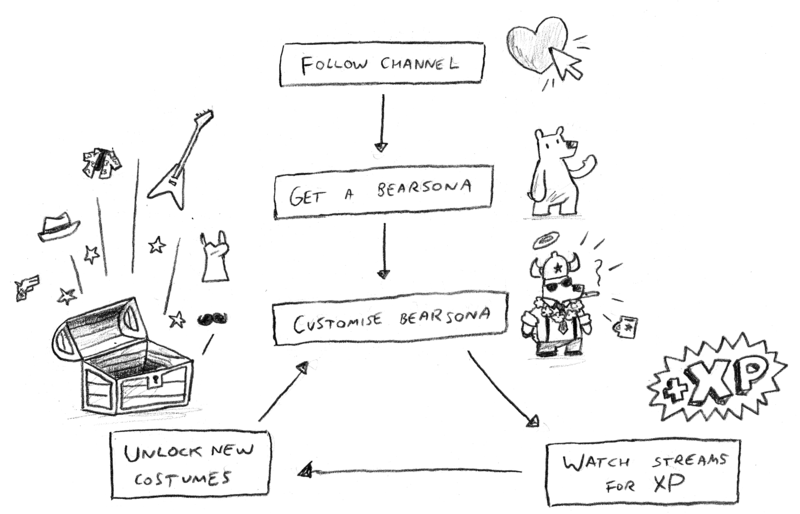 The bearsona system started on April 2018 and has had reliable monthly updates. We got the system going and it will continue operating until further notice. I will be posting plans for upcoming feature on the Patreon page and in my Discord, so you know where your money is used. Don't think this is "just $1"! It all adds up and I appreciate it. This will cover monthly expenses for new bearsona costume sets. A set usually has between 10 and 15 items (depending on theme) and contains a mix of clothes, hats, companions and accessories.